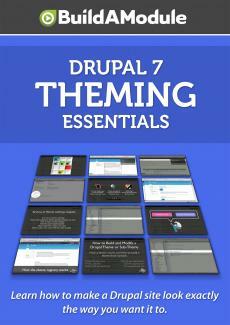 Over the course of the last three chapters, you've learned a lot about theme building. We started off with building a theme from scratch and we did everything from creating a dot info file to setting up the file structure. We looked at how to create a screenshot and include it in your theme directory. In a practical sense we're rarely going to build a theme from scratch. So next we looked at how to build a sub-theme. How to use an existing theme as the base theme and leverage all the existing code and resources inside of that theme but be able to extend it and override specific aspects of a theme using the sub-theme. We then looked at how to copy an entire theme and duplicate it using all of it's resources but locking it down in a way that's not possible with a sub-theme. We looked at how to identify the places that need to be changed in order to make a theme copy our own theme. We looked at how to organize CSS files in a meaningful way. A lot of times we begin with just a giant CSS file and it makes sense to split it up according to various parameters. For example, a lot of themes have a "layout dot CSS" file for a layout specific styling. And then another one for general styles that are used across the theme.